Click the button below to add the SRAM X01 Eagle GXP Groupset to your wish list. SRAM led the way in the single-chainring drivetrain revolution that's swept through mountain biking and cyclocross in the past several years, and that trend only accelerates with the introduction of SRAM's new Eagle 12-speed groupset. Whereas SRAM's 1x11 platform was already ahead of the curve, as far as drivetrain tech and performance goes, Eagle 1x12 makes countless improvements all over to improve the single-ring experience even more. Both the grip-shifter and trigger-shifter internals have been upgraded to make shifting smoother and quicker without sacrificing SRAM's famous "click-click" action. The new 12-speed chainrings' X-SYNC teeth have been re-cut to improve debris clearance, chain retention, and drivetrain life, and Eagle's crankset is now the strongest carbon MTB crank in production. The rear derailleur is more durable, with smoother shifting action and pedaling, and more reliable chain retention, thanks to the new, lighter Type 3.0 clutch bearing and a 14-tooth lower pulley wheel with X-SYNC teeth. Finally, Eagle's chain is the smoothest, lightest, strongest, and quietest that SRAM has ever produced, and it comes coated in titanium nitride for ultimate longevity. SRAM's Eagle 1x12 drivetrain comes in two versions: XX1 and X01. XX1 is intended for cross country and light trail riding, featuring extensive use of carbon fiber and a fully hollow set of crank arms. 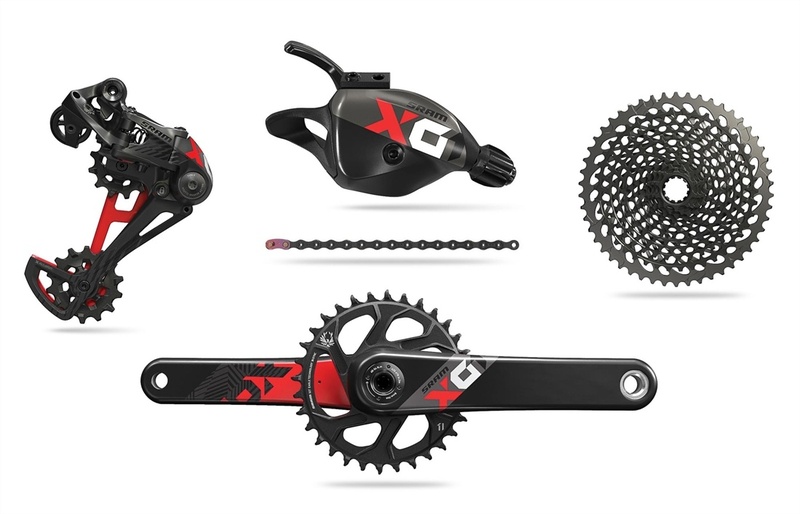 X01 is slightly heavier, but more durable, thanks to the substitution of aluminum in place of carbon fiber in critical areas of the drivetrain, and the use of a reinforced foam core inside X01's crank arms. Please note that Eagle comes with either a PressFit/BB30-style crankset or a GXP-style crankset, but neither groupset includes a bottom bracket.